This paper explores how Edmund C. Berkeley tried to instruct and popularize high-speed computers in the 1940s and 1950s and how Berkeley emphasized the connection between computers and symbolic logic. Berkeley strengthened his conviction in the significance of symbolic logic and Boolean algebra before his graduation from Harvard University and maintained this conviction for more than 30 years. Berkeley published books and articles, including Giant Brains, and sold electrical toy kits by which young boys could learn electrical circuits and their logical implications. The target audience of Berkeley covered wide range of people including those who were not making computers but were interested in using them, that is, amateur adult technology enthusiasts who enjoyed tinkering with technology or reading about science and technology, and young students. In these projects Berkeley used Shannon’s paper of 1938, “A symbolic analysis of relay and switching circuits” as a theoretical basis of his conviction. Design of these kits was fine-tuned by Claude E. Shannon. This paper analyses the changes in the image of Madame Lavoisier from the perspective of gender in two centuries worth of academic literature. From her lifetime to the end of the twentieth century, which marked the 200 years anniversary of Antoine Lavoisier’s death, this woman was mainly praised as the quintessential sensible woman who had been dedicated to her husband, the father of the Chemical Revolution. Whereas this was intended as a praise to Madame Lavoisier, an investigation conducted from this perspective does not mean it depicted her as one of the intellectuals of the eighteenth century. On the other hand, a study that attempted to portray who she really was, due to the gender question, could be accused of bias and manipulating the historical documents; furthermore, if such a study adopted an unsuitable methodology, it would only end up emphasizing her as a “”wicked woman””. From the perspective of second-wave feminism, personified by the slogan ”The personal is political””, this paper shows the importance of the perception of Madame Lavoisier as a person who supported the Chemical Revolution in her own right. Such a perspective demands an analysis of how Marie-Anne Lavoisier has been described more recently, especially before the emergence of second-wave feminism, as well as how the research on her changed after this shift in feminist thought occurred. Such works can answer the question of when scientists attracted attention in history. In particular, this paper will compare the ways that female and male scientific researchers have attracted attention and shed light on the reasons for the difference between how the two sexes have been treated, to stop adopting the view of the strong and the tendency to group humans according to different conditions and think of them as being the same. This research approach will be a usef11l method for not only gender minority studies in the history of science but also for other minority studies. The cultural authority of science reached its peak during the period of high modernity. Various countries and societies partook in this trend, but it found its ultimate expression within the communist, Soviet-type polity. This article discusses the cultural underpinnings of this characteristic feature of Soviet society and examines one of its major ramifications, the key role of scientific actors in creating and shaping the basic features of Soviet civilization. Examples illustrate this role in different time periods: from building the foundations of the Soviet state in the 1920s, through determining the major vectors of Stalinist economic expansion and industrialization, to designing some key priorities of post-Stalin reforms and the later perestroika. Different types of actors drew their power and inspiration from the cultural authority of science- “bourgeois specialists,” amateur enthusiasts, engineers-turned-politicians, and nuclear physicists. Some of the important legacies they left behind continue to persist today, even if often misattributed, so that a historical analysis is required to uncover their original roots. The postwar period is often viewed as the “Golden Age” of Soviet mathematics, yet the mathematical community in that period faced serious constraints. Restrictions on foreign travel, limited access to foreign literature, obsessive secrecy regulations, an obsolete university curriculum, the declining level of the faculty, discriminatory policies in university admissions and employment, and limitations on physical access to universities and research institutions – all these factors worked against the creation of a fully functional research community. This article argues that the thriving of Soviet mathematics in that period was due to the creation of a parallel social infrastructure. Soviet mathematicians organized a network of study groups (“math circles”), correspondence courses, and specialized mathematical schools in major cities, opened free courses for students barred from top universities, offered employment at applied mathematics institutions to talented researchers who were denied academic positions, and developed an extensive system of open research seminars, bringing together multigenerational groups of researchers and fostering collaboration and the spread of new ideas. 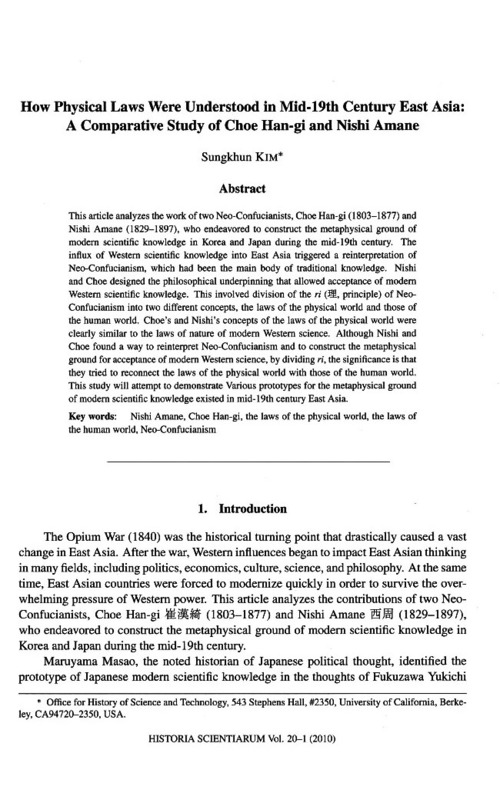 This article analyzes the work of two Neo-Confucianists, Choe Han-gi (1803-1877) and Nishi Amane (1829-1897), who endeavored to construct the metaphysical ground of modern scientific knowledge in Korea and Japan during the mid-19th century. The influx of Western scientific knowledge into East Asia triggered a reinterpretation of Neo-Confucianism, which had been the main body of traditional knowledge. Nishi and Choe designed the philosophical underpinning that allowed acceptance of modern Western scientific knowledge. This involved division of the ri (理, principle) of Neo-Confucianism into two different concepts, the laws of the physical world and those of the human world. Choe’s and Nishi’s concepts of the laws of the physical world were clearly similar to the laws of nature of modern Western science. Although Nishi and Choe found a way to reinterpret Neo-Confucianism and to construct the metaphysical ground for acceptance of modern Western science, by dividing ri, the significance is that they tried to reconnect the laws of the physical world with those of the human world. This study will attempt to demonstrate Various prototypes for the metaphysical ground of modern scientific knowledge existed in mid-19th century East Asia. Hallerstein’s astronomical excellence was widely recognized recently. As one of the prominent scientist attached to the Chinese Imperial Court, he was involved in other types of research besides astronomy, but his authorship was not always obvious amidst the Jesuits’ collective work. Besides astronomical observations the Beijing Jesuits also provided early electricity experiment, which enabled Volta’s inventions of the electrophorus and battery. The development of such devices paved the way for electrical observations that were longer in duration than the quick ones conducted with the Leyden jar. The scientists urgently needed a new approach because they wanted to know the process responsible for an interesting electrical spark. Electric experiments became fashionable in European high society meetings, as vacuum pumps had somewhat earlier. Both innovations were introduced to the Chinese court in Hallerstein’s time, but never garnered the same amount of interest as Western astronomy did. 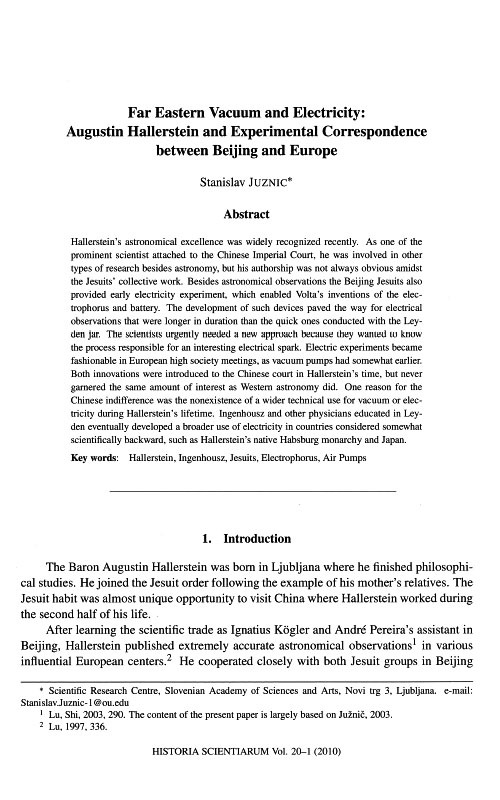 One reason for the Chinese indifference was the nonexistence of a wider technical use for vacuum or electricity during Hallerstein’s lifetime. Ingenhousz and other physicians educated in Leyden eventually developed a broader use of electricity in countries considered somewhat scientifically backward, such as Hallerstein’s native Habsburg monarchy and Japan. Rudolf Clausius’s 16 papers on the mechanical theory of heat have been studied through four various methods, i.e. 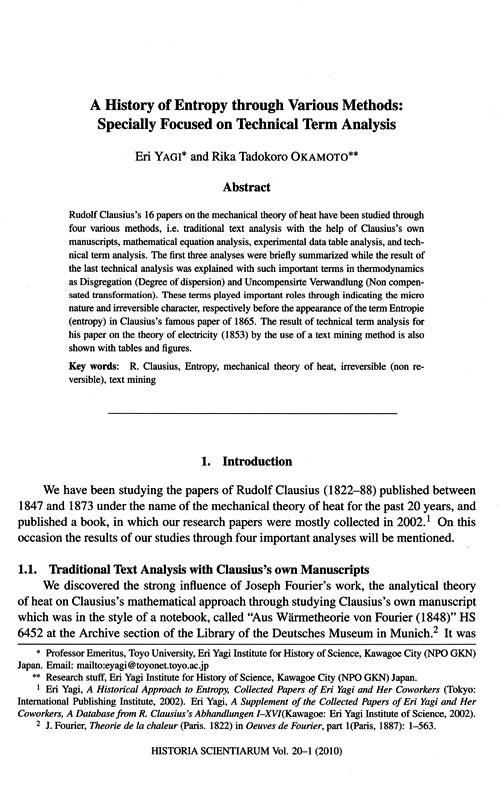 traditional text analysis with the help of Clausius’s own manuscripts, mathematical equation analysis, experimental data table analysis, and technical term analysis. The first three analyses were briefly summarized while the result of the last technical analysis was explained with such important terms in thermodynamics as Disgregation (Degree of dispersion) and Uncompensirte Verwandlung (Non compensated transformation). These terms played important roles through indicating the micro nature and irreversible character, respectively before the appearance of the term Entropie (entropy) in Clausius’s famous paper of 1865. The result of technical term analysis for his paper on the theory of electricity (1853) by the use of a text mining method is also shown with tables and figures. Ferdinand Fellmann: Scholastik und kosmologische Reform(‘Beiträge zur Geschichte der Philosophie und Theologie des Mittelalters,’ N.F. Bd. 6) Münster, Aschendorff, 1971, SS. 70. Ken-Ichi Iida: Nippon Tekkō Gijutsushi Ron (Technology of Iron and Steel in Japan) San-Ichi Shobo, 1973, 466 pp. The System of the Book of Charges and Chinese Science..
Errata:Eri Yagi, “On Nagaoka’s Satumian Atomic Model (1903),” No. 3 (1964). The History of Mathematics Society of Japan started, as the present writer reported previously in our joural***, for the purpose of researches in the history of mathematics in general, not confined in particular fields of mathematics.However, the members of Society are inclined to restrict their field to Japanese mathematics and concentrate their studies in the history of the traditional ones — WASAN****. In fact, most of the members, with the exception of a few, have been keenly interested in WASAN. The following are the table of contents which appeared in the recent issues of Sugakushi Kenkyu*****(or Journal of History of Mathematics, Japan). * The address of society is 日本数学史学会(NIHON SUGAKUSHI GAKKAI), Fuji Junior College, 3-chome, Tozuka-machi, Shinjuku-ku, Tokyo, Japan. ** Maebashi Technological Junior College, Kamisadori-machi, Maebashi city,Gumma-ken. 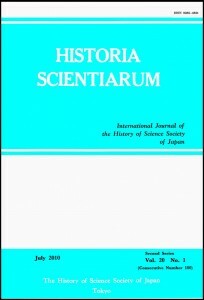 *** Japanese Studies in the History of Science, 1966, No.4. **** 和算 – Japanese Mathematics which was prevalent during the Edo period(1603-1867). 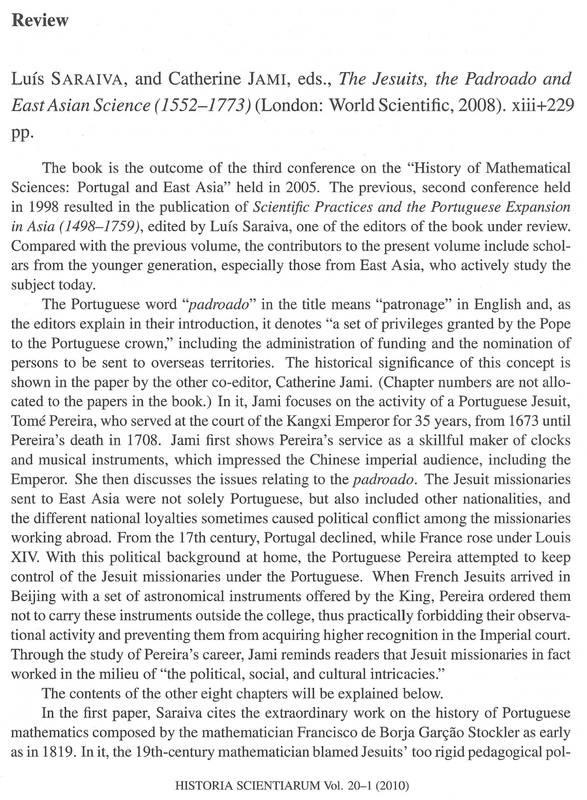 ***** 数学史研究The Journal of History of Mathematics, Japan.